Have you jumped on the Golden Milk trend? If not, no worries, I’ve got you covered! Not only does this combine the beauty of turmeric, it’s also dairy free and a latte shake! 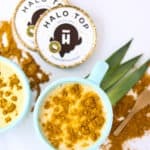 Disclosure: The recipe contained in this post was created for my client, Halo Top Creamery. While no compensation was exchanged for this post here, I always like to be transparent! Thank you for supporting the brands that keep the Shaw Kitchen running! Sometimes I like to think I’m trendy… like the time I made a Pumpkin Spice Latte into a shake. But, then I’m reminded how NOT trendy I am. Case and point, I still am an avid rollerblader. I still listen to N’SYNC holiday jams and sing to Mariah Carey in the shower. Regardless of how trendy I may NOT be, this Golden Milk Latte is certainly on point. Did you know Golden Milk Latte’s can be enjoyed chilled?! Not only is there a fun twist on this Golden Milk Latte (hello frozen delight used in place of traditional coconut milk), but it’s also got the option for a little salted caramel fun, too! If I haven’t sold you yet, listen closely. DYK Golden Milk Latte’s can be made at home, too?! This entire latte is ready in less than 5 minutes, flat. Plus, you can enjoy it from the comfort of your own home, sans lines, noise and chaos of the coffee shop. Yes, silence, peace and serenity with a Golden Milk Latte. 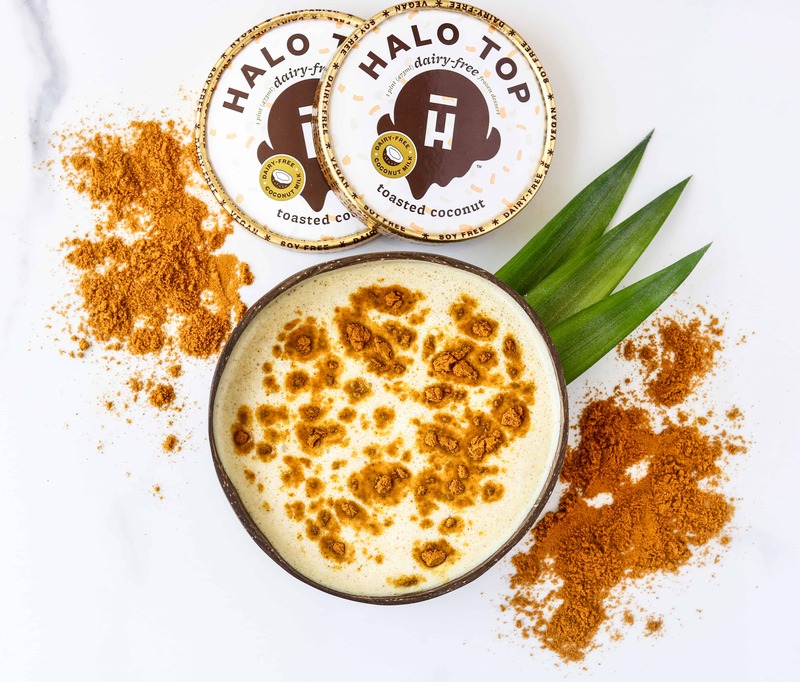 A delicious blend of turmeric, cinnamon, and ginger with ice cream and dairy free milk! *Sea Salted Caramel is also a great substitution for the coconut as well. Now tell me, have you jumped on a trend lately? Which one? Are you a Golden Milk Latte fan? I love golden milk lattes and cannot wait to try this one! 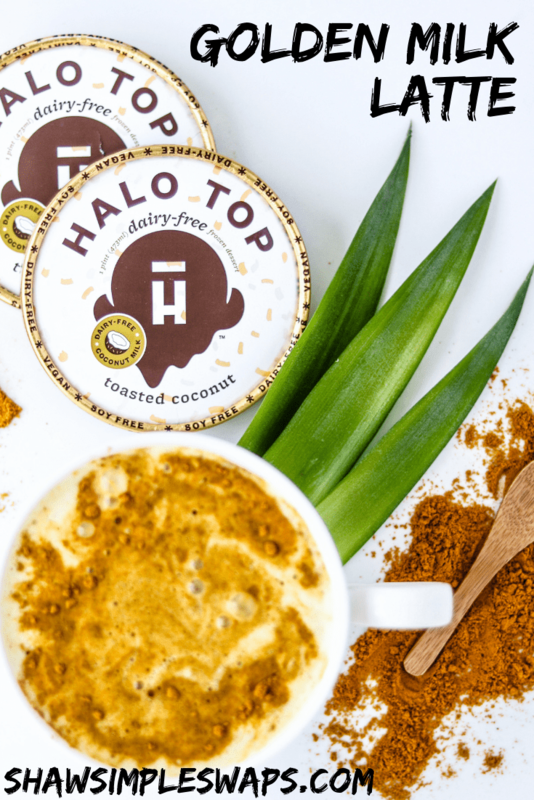 Already have the Toasted Coconut Halo on my list to buy this week so I can give it a try. Woah, woah – listening to NSYNC is still super trendy!!! I just wish I was listening to some while enjoying this deliciousness with you! Love love golden milk, I can’t wait to try this version! This is genius!! I haven’t tried this ice cream yet as I’ve haven’t seen the dairy-free one here in stores but I would so try this as soon as I find it! OHHH NSYNC Christmas jams are the best though. 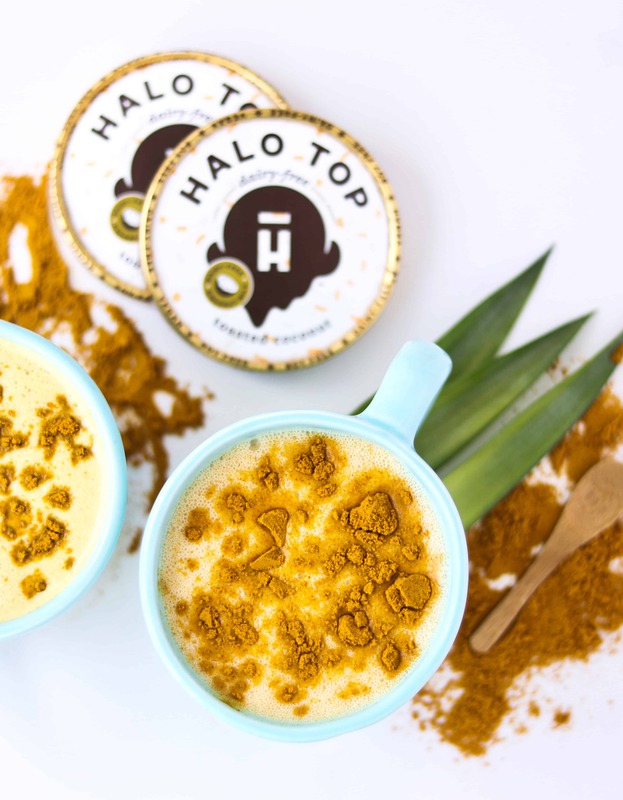 🙂 This Golden Milk Latte sounds so delicious and such a great use of Halo Top! I need to try it! Mmm that sounds good and I can have it. I hope the commissary carries this when I go shopping. I hope so too! If not I’ll make it when you come visit me! Yum, love the flavors of the toasted coconut and turmeric together! This combo was so delicious! Going to buy more Halo top today – thank you Liz! The toasted coconut is my favorite flavor, I always keep on in the freezer! Looking forward to making this soon! Mariah Carey in the shower never ever gets old!!! Thanks for this amaaaaazing treat–loved it!